Mount Olympus in Washington State (Wa) is at the heart of the Olympic Peninsula. It is has the tallest peaks in the Olympic Mountains. It's west peak is 7,980 feet above sea level. This one of the reasons climbing her such a unique experience, because the Hoh River Trailhead (approach trail) is in the 600 feet elevation range. That is a lot of up! The mountain is literally surrounded by rain forest. Because of this, Olympus generally falls under heavy snow each winter. There are several receding glaciers that decorate its rock, which include Blue, Hoh, Humes, Jeffers and White Glaciers. All the glaciers mentioned are viewable from various places inside the Olympic National Park. Most take several days on or off trail to witness, but the effort is well worth it. Doesn't that sound amazing? Did you know? A person can just see the top of Mount Olympus on the Hurricane Ridge Webcam! The Bailey Range blocks most of the mountain from view at the Visitors Center. Did you know I climbed on Mount Olympus with toe shoes? Check it out! Best Places to View Olympus? Planning a hike? 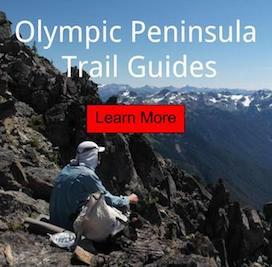 Be sure to check out my Olympic National park trail guide.